Grace Christian Academy's next Parenting with Purpose seminar will be January 31st and February 1st. 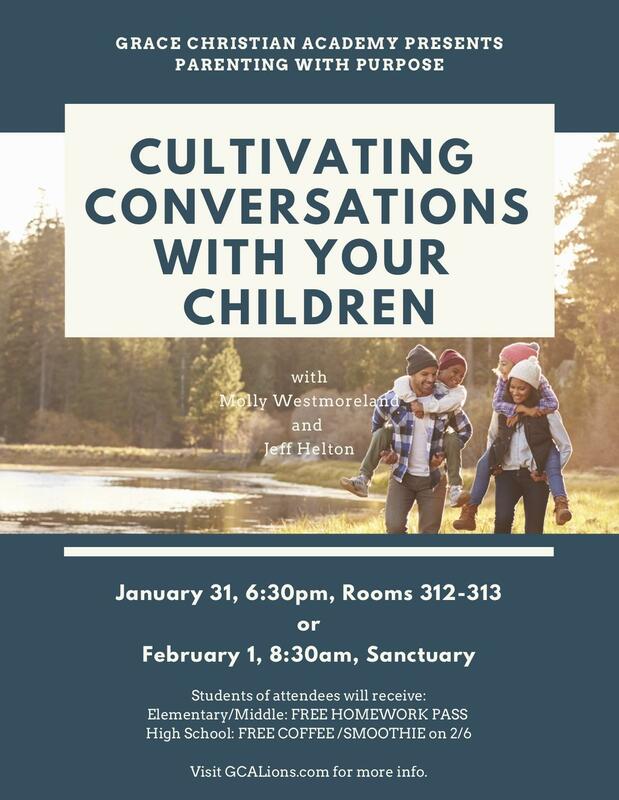 With two opportunities to attend, join us for this one-hour session with Molly Westmoreland and Jeff Helton as they focus on learning to have those conversations with your children, both the difficult ones and the ones that help to deepen the parent-child relationship. This event is open to the public, so invite your small group, family, co-workers, and friends! We as a school believe that these parenting seminars are important and necessary as we partner with you, so we are offering an incentive for your children if you attend this month’s parenting event. Elementary and Middle School students will receive ONE FREE HOMEWORK PASS, and High School students will receive a coupon for ONE FREE COFFEE OR SMOOTHIE from Java Breeze when they are at our school on Wednesday, February 6th.